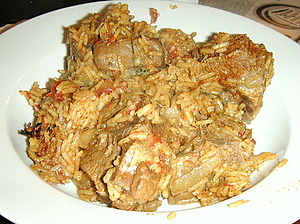 Machbous is Bahrain's most traditional dish. It's also eaten throughout the Gulf. A stew of lamb or fish made with rice, it's satisfying and homey - and we enjoyed it very much. The flavors are familiar, I'm sure I've made similar stews before, but different enough from everyday fare in the west to make you take notice. The recipe I found for machbous wasn't necessarily bahraini, but I'm sure it's close enough. It's main ingredient is baharat, a fairly simple spice mix. Alas, it calls for whole spices that you then need to grind together. Unfortunately, my mini-chopper was not up to the task, and I couldn't manage to do it with a mortal and pestle either, so I had to substitute with ground spices instead. I'm sure it would have been better with freshly ground ones. I also used less proportionally pepper than it asked for, as I was hoping my spice-phobic children would eat it. The youngest one liked it a lot, though the older one wouldn't try it. The original recipe asks for "jointed lamb", and I have not the slightest idea what that means. I bought some really small arm chops that were on sale at Safeway for 99-cents a pound (down from $11 lb - they had to sell them that day), and they worked really well. If you use larger chops, I'd suggest cutting them into bite size pieces, with or without bones. Do cook the lamb for a full 30 minutes, so that it falls off the bone when you eat it. I also substituted canned tomatoes for fresh ones, as I realized at the last minute that I'd forgotten to buy them. I think it worked out fine. Mix the black pepper, coriander, cinnamon, cloves, cumin, cardamon, nutmeg and paprika and set aside. Salt the lamb. Saute it with the onions on the oil, until the lamb is brown and the onions are golden brown. Add the prepared spice mixture, the tomatoes, the parsley, the lime peel and the turmeric. Mix well, bring to a full boil, then reduce the heat and simmer, covered, for 30 minutes. Add rice and water, cover, and simmer for an additional 20 minutes. Serve.